Sinn Féin’s Martin McGuinness is to stand down from electoral politics, signalling the closure of one of the most remarkable chapters in recent Irish history. 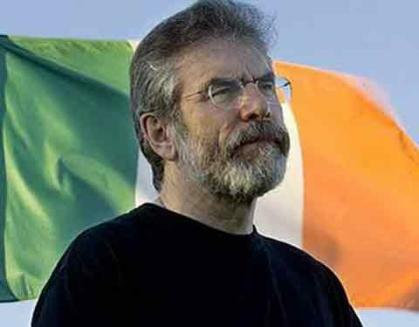 Party president Gerry Adams has called on party members and republicans to “give him the space to get better” so that he can come back to an improved situation. 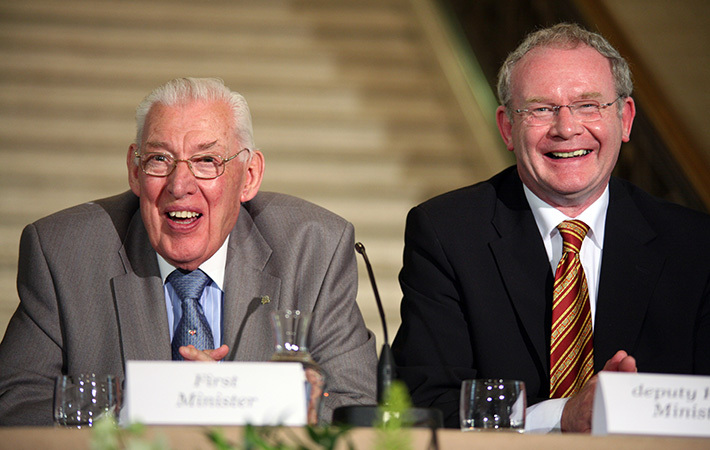 McGuinness’s successor as leader of Sinn Féin in the north will be announced next week after Mr McGuinness told the Irish News that health problems prevented him from defending his Foyle seat in the forthcoming poll. Sinn Fein’s Martin McGuinness has announced he is quitting frontline politics to concentrate on recovering from “a very serious illness”. McGuinness resigned as Northern Ireland’s deputy first minister last week in protest against the handling of a botched energy scheme, forcing a snap election. He has now revealed that after “a lot of thinking” he will not be contesting those elections due to ill health. 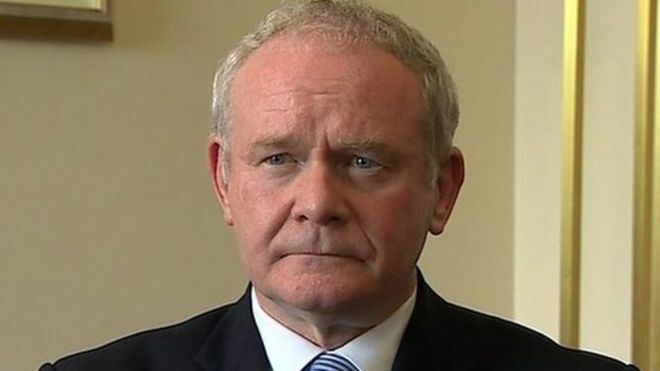 Sinn Fein‘s Martin McGuinness has announced he is quitting frontline politics for health reasons and will not seek reelection to the Stormont Assembly. 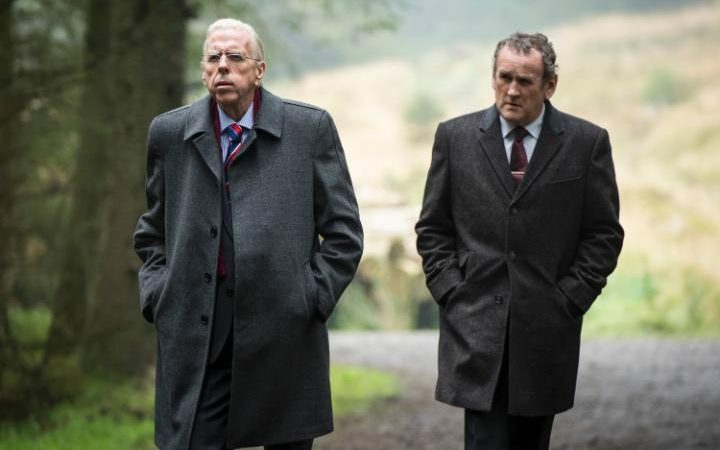 McGuinness said it was initially his intention to stand down in May, on the 10th anniversary of the power-sharing Executive, but that his health and the current political crisis had “overtaken the timeframe”. He added that he was not “physically able” to continue in his current role. This entry was posted in Northern Ireland, Politics and tagged Martin McGuinness, Northern Ireland Assembly, Sinn Féin on January 19, 2017 by admin. Fionnuala O Connor in The Irish News, nationalist. Though it stuck in many craws to admit it initially and could never have converted some, the man known first as an IRA leader of clinical ruthlessness became an able front-of-house performer. … Sinn Féin’s best northern performer by some distance has carried too much expectation for too long. His departure ahead of Gerry Adams, now an uncertain performer who does more harm than good, is a blow to the party. Martin McGuinness has travelled a long way since his days as an IRA commander. Not only did he agree to share power at a Stormont parliament under the ultimate sovereignty of the UK, he has even at times seemed to be a moderate and pragmatic power at the top of Sinn Fein during previous crises such as over welfare reform. But a self-righteous, hypocritical and objectionable side to the outgoing deputy first minister was on display yesterday. From IRA commander to political reconciler – the changing faces of Martin McGuinness, Belfast Telegraph, centrist. McGuinness has an air of innocence about him, an almost childlike gladness in his nature, and yet he is the man who led the hard men. Many of his former comrades are so appalled by the incongruity, the mismatch between the reconciler and the old soldier that they no longer believe he was ever really on their side. He went further in his efforts to reassure unionists than they did in any effort to placate nationalism and republicanism. Martin McGuinness’s departure represents failure on all sides, Newton Emerson in The Irish Times, Dublin. McGuinness may be leaving office with his dignity intact, and many in Sinn Féin will relish the firmer line to come, but his departure still represents failure for all sides in Northern Ireland. Once again, unionists are about to be taught the lesson they never learn: deal with nationalism now, or get a worse deal later. Malachi O’Doherty in The Guardian, London. …there is a high price to be paid for bringing down Stormont and forcing the British to restore direct rule. An obvious one is that the inquiry into the lavishly funded heating scheme will not now take place. McGuinness may have scuppered the very thing he was demanding. This entry was posted in Northern Ireland, Politics and tagged Martin McGuinness, Northern Ireland Executive on January 11, 2017 by admin. McGuinness is expected to make a second announcement 10 January about whether or not he will seek office again in the expected fresh election triggered by his resignation. Reporting from The Guardian. Martin McGuinness is to resign as Deputy First Minister of the Northern Ireland Executive in protest at the Democratic Unionist Party’s handling of a botched renewable energy scheme, The Irish Times and other media report 9 January. 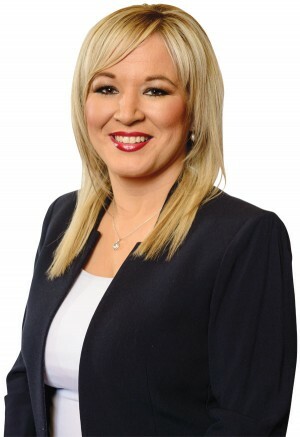 The Sinn Féin politician’s move is likely to lead to a snap Assembly election. This entry was posted in Northern Ireland, Politics and tagged Martin McGuinness on January 9, 2017 by admin. Queen Elizabeth II, who last September became the longest-reigning monarch in British history–64 years and counting–turns 90 on 21 April. In the course of a century, the editors of this magazine have unashamedly championed the cause of Irish freedom. In doing so, we have had a few unkind words to say about the British and the queen’s predecessors. As we mark the centenary of the Easter Uprising, we celebrate the fulfillment of our forebears’ dreams, but we also repent of what we too have done and failed to do. Yet in repentance there is hope, the very hope we saw during those mid-May days in 2011. 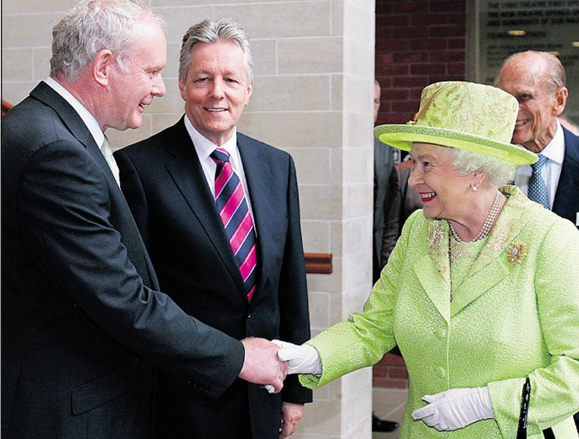 In June 2012, in Belfast, the queen and former IRA commander Martin McGuinness had one of the world’s most celebrated handshakes. Two years later, McGuinness accepted the queen’s invitation to attend a British state banquet at Windsor Castle. By then, many of us had grown used to seeing soaring sounders of swine. And so a birthday bonfire will burn atop Slieve Donard in County Down, as well as the highest peaks of Scotland, Wales and England, in addition to all the other pomp to mark Elizabeth’s 90th. I’ll just add: Sláinte! This entry was posted in History, Northern Ireland, Politics and tagged County Down, Martin McGuinness, Queen Elizabeth II on April 20, 2016 by admin.